Geology • But "notorious" clay bedrock isn't mentioned in supplemental study. 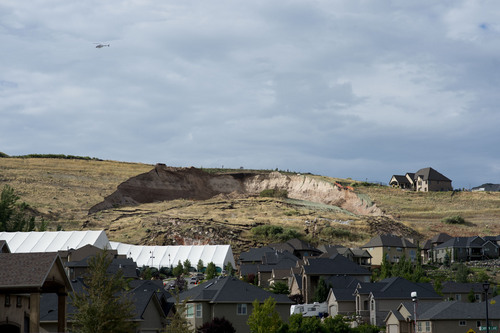 Jeremy Harmon | The Salt Lake Tribune A huge scar from a landslide is seen above Parkway Drive in North Salt Lake on Tuesday, August 5, 2014. 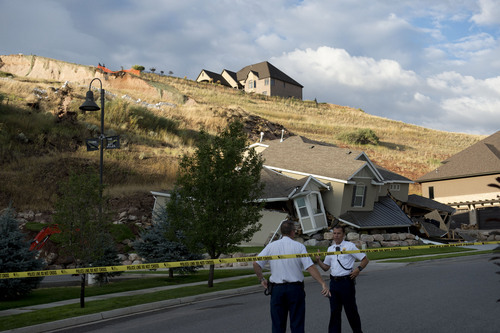 Jeremy Harmon | The Salt Lake Tribune This home at 739 Parkway Drive in North Salt Lake was destroyed by a landslide on Tuesday, Aug. 5, 2014. 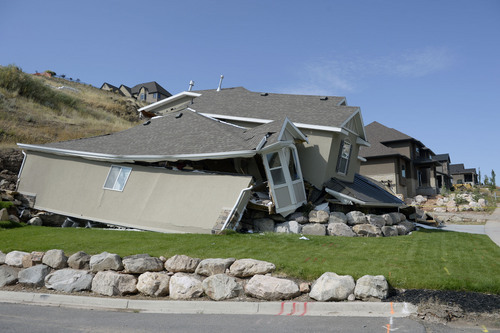 Al Hartmann | Tribune file photo A home destroyed by an Aug. 5 landslide at Parkway Drive in North Salt Lake. Rubble from the landslide fell into the parking lot of Eagleridge Tennis and Swim Club next door. Residents were safely evacuated. Al Hartmann | Tribune file photo A home destroyed by landslide at Parkway Drive in North Salt Lake. A 2003 report found the area safe for development but warned of a clay bedrock that could result in landslides with too much water. A supplemental study submitted to the city contained no mention of the bedrock. 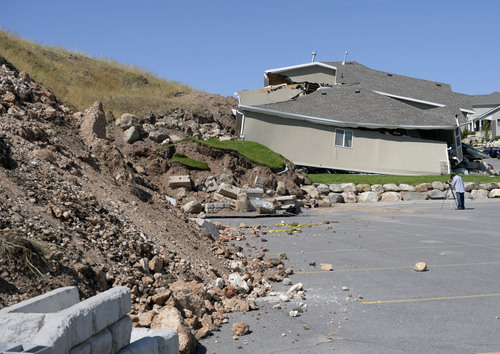 Although a 2003 geotechnical report warned of the potential for landslides at Eaglepointe Estates in North Salt Lake, a 2013 supplemental study made no mention of the clay bedrock flagged for attention in the first and that one geologist called "a notorious bad boy" for instability. There is no written review of the developer-commissioned June 2013 geotechnical study that pronounced as "globally stable" the lots at the crown of the massive landslide that crushed one house and damaged a tennis club on the morning of Aug. 5. Ten residents escaped the house uninjured. The residents of another house on Parkway Drive remain unable to return until safety-mitigation measures are completed. Paul Ottoson, city engineer for North Salt Lake, said his department "typically" does not produce written reviews of such reports or send them to other specialists for review. The city, he said, relies on geotechnical engineers&apos; reports before giving the go-ahead for building. "We just look to see if it&apos;s good to go," Ottoson said of the 2013 report. The slide occurred after several days of heavy rains that may have triggered the event  as the report 11 years earlier had warned. That earlier geotechnical study said there was a potential for "landsliding" in that area if the clay bedrock was exposed to too much water. The more recent June 12, 2013, report from GSH Geotechnical Inc., of Salt Lake City, was commissioned by Sky Properties, the developer of Eaglepointe. It was a supplemental study to the April 29, 2003, report by California-based Applied Geotechnical Engineering Consultants  also hired by Sky Properties. An early warning • The 2003 report said the North Salt Lake foothills were generally suitable for development. It noted, however, that some areas needed more analysis to avoid potential hazards. "Based on [geologic hazard] maps," it said, "a more detailed study on portions of the proposed development is suggested for surface fault rupture, landslide and debris flow." That report makes numerous references to the geology of the Eaglepointe area. Portions of it were a gravel quarry at one time and the gravel and sand of that alluvial formation sit upon clay bedrock. The report looked at a 1998 slide at the nearby Springhill development, which also sits atop bedrock geologists label Norwood Tuff  a tuffaceous clay. When the clay gets wet, it becomes slippery and unstable, according to geologists. "We believe the landsliding at Springhill subdivision was triggered by the unusual heavy precipitation and attendant increase in groundwater levels," the report states. Kimm Harty, deputy director of the Utah Geological Survey, called Norwood Tuff a "notorious bad boy" for instability. But she added that she did not know the cause of the North Salt Lake slide. The 2003 report goes on to say that lands nearby could be vulnerable to the same phenomenon. "Several subdivisions and the Eaglewood Golf Course are up gradient from the Springhill subdivision. Future increased contribution of water from these developments or other unknown up-gradient sources could be a factor in landsliding." No mention of bedrock • The 2013 supplemental report does not mention bedrock or tuffaceous clay. GSH refused to comment and referred questions to Sky Properties. Scott Kjar, a spokesman for Eaglepointe and Sky Properties, said his firm depends on geotechnical experts  as required by Utah law. "We hire experts to give us their best advice," he said of the 2013 report. "Obviously, if we had anticipated a problem, we would have done something to mitigate it." The Salt Lake Tribune contacted seven active and retired geotechnical experts in the public and private sectors requesting a review and comparison of the 2003 and 2013 reports. None would go on the record. Some said they feared being caught up in a legal dispute. This week, North Salt Lake officials released a statement saying the municipality was not liable for damage caused by the slide. "The city required a soils report from a qualified engineer for the entire subdivision and required another specific report for the latest phase of the subdivision," they said. "Both of these reports indicated that the land was suitable for the subdivision and the city relied on those reports as it made decisions." According to state law, once those slopes were deemed safe by geotechnical experts, the city could not deny building permits to Sky Properties without leaving the municipality liable for financial damages, according to Utah&apos;s Office of the Property Rights Ombudsman. There is one notable exception to that truism, however, according to Brent Bateman, lead attorney for the state agency. "A compelling countervailing public interest" would allow a city to deny a building permit if it could demonstrate that the land posed a potential hazard. But that would require further analysis that could be costly  and such additional steps are not mandated by Utah law. Nonetheless, Draper does just that. It hires independent geotechnical engineers to review all soil reports submitted by developers, said Russell Fox, assistant city manager. In addition, the city&apos;s geotechnical experts are on site when the developer&apos;s engineers test soils for stability. Until 2008, cities could request that the Utah Geological Survey review geotechnical reports, said Steve Bowman, a spokesman for the agency. But it was not a requirement. "We never had regulatory authority," he said. "It was up to the cities to follow up if they wanted to." However, without a budget for such activities and mounting responsibilities with a relatively small staff, the governing board of UGS discontinued the practice.